Q. What makes "sullenly" a better answer choice than "docilely"? A. For the second blank, I think we can agree that the word "silently" is a pretty good guess for making up our own word. From the second to the third sentence, the character goes from not speaking at all, to speaking nonstop. Knowing this, we can go back to the first blank. We know the characters change a lot (speaking—>not speaking), so they would be rarely _____ ? Stable fits nicely here. For the second blank, we are looking for a word that means something similar to "silently." This character who is "silent" is retreating off to the corner of the room, and does not want to talk to anyone. "Docilely" indeed is a tempting answer choice, however its connotation stops it from being the perfect answer. "Docile" means that you yield to supervision, or that you go along with things easily. However, in this sentence, the character is NOT going along with things, but rather he is retreating from everyone else and not taking part in the dialogue. "Sullenly" means that you like to be alone, that you're a solitary person, or that you're sulky. This fits perfectly in the blank. OK, welcome to the first module on three blank text completions. You guys are finally here on these large, long text completions, so let's have a quick introduction to what's going on here. You'll notice, of course, three blanks. For each of those blanks, we'll have three answer choices. In order to receive full credit, you'll have to answer each blank correctly. If you do the math, that ends up actually 1 out of 27 chance of guessing correctly, so don't bet on basically guessing correctly. 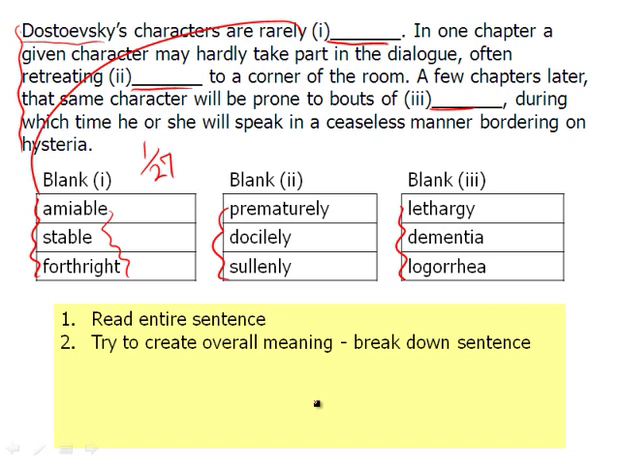 So I'm going to teach you in this module the basics, so you can go through these three blank text completions and not have to guess, but get them correct. So what you'll see here is that this three blank text completion has three sentences. That, however, is not always the case. These are some variable beasts here. We have have a one blank, or one sentence three blank text completion as you'll see. A two sentence, three blank text completion, a three sentence, and even a four sentence, three blank text completion. There's a whole lot of variety going on, but strategies are pretty much the same. We want to read the entire sentence. Get ourselves through here. Once we do that, we want to break down that sentence. Make sense of it. What's going on? So let's start that. "Dostoyevsky", and if you don't know how to say his name, 'D'. "D's characters are rarely _______". Now, what do you notice? Well, that very first blank, it could be any of these three words. So there's no way we can know without reading on. So continue reading, we get, "In one chapter a given character may hardly take part in the dialogue", huh, this character's really not talking, "often retreating _______ to a corner of the room." OK, so they're maybe retreating silently because they're not saying much. So just as I've done in other text completions, I'm putting in my own words as I read through. "A few chapters later, that same character would be prone to bouts of ______, during which time he or she would speak in a ceaseless manner." So they go from not speaking at all up here, retreating silently, to speaking in a ceaseless manner. They keep talking and talking. So these characters, aha, they are rarely what? So now, we can go back to this first blank. This is really an issue of reading deep. And what I mean by that is not just reading the entire sentence, but knowing that sometimes the clue to the first blank will come way down at the bottom. So you really have to read deep to figure out what that first blank is, or sometimes even a second blank. It won't be right around the second blank here maybe, but it could be at the very end, so always read deep. Try to create overall meaning, which we've done. So now, we can come up with the word for the first blank, that his characters are rarely predictable, or are rarely the same. We look at these words. We see friendly. That is not what's going on here. Stable. Well, if something is the same, it's predictable. It's stable, and there's our answer. Forthright means honest. That doesn't quite work in the context. And now we can go to the second blank, and we see prematurely means early, or done beforehand. It doesn't mean silently. Docilely means you just go along with the program, but here, they're kind of retreating off to the corners of the room. They don't want to talk to anyone. And if you're sullen, you're sort of downcast and moody, and you don't feel like talking to anyone. So there's definitely a good answer. Then, finally, we go to the third blank here, and we say, "Well, we need a word that means speaking in a ceaseless manner." So through process of elimination, lethargy means tiredness. That definitely doesn't work. Dementia, you're crazy. You're demented. You're insane. Here, we see hysteria, but that doesn't necessarily mean you're insane. You're just speaking constantly, as though you really have something to tell somebody. That's not dementia. Finally, this strange word. But through process of elimination, of course, that is actually the answer. Logorrhea. Logo- comes from the root for word. -rrhea means lots of something, an outpouring. So basically, an outpouring of words. So again, we went through here. We read the sentence or the text completion of the entire thing, and now we want to make sure, of course, that when we actually click, check, check, check on the answers that they make sense. It's good to plug them in and read. Read through to make sure there is this coherent meaning. OK, so coherent meaning. Let's try. "Dostoyevsky's characters are really stable. In one chapter, a given character may hardly take part in a dialogue, often retreating sullenly to a corner of the room. A few chapters later, that same character will be prone to bouts of logorrhea during which time he or she will speak in a ceaseless manner boarding on hysteria." So there we go. We've gotten the answer, and no longer is it 1 in 27, but it's on this case, 1 for 1.